Piniella vs. Sandberg could be the most compelling off-season story. 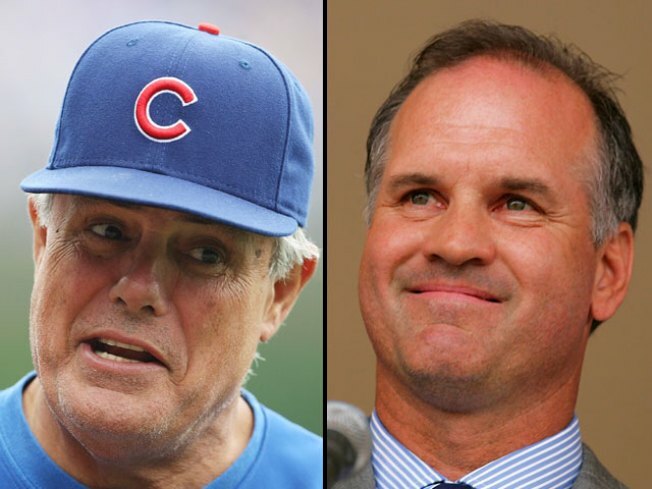 They won't be playing against one another any time soon, but Cubs Manager Lou Piniella and Iowa Cubs Manager Ryne Sandberg will square off at the Cubs convention this weekend in a battle for Cub's fan popularity. Sandberg has made no secret of his desire to helm the team in the coming years and Piniella's contract is up in 2011. Through an apparent scheduling snafu, noticed by the Chicago Tribune, both coaches will be addressing the Cubbie faithful at the exact same time. Piniella will participate in a question-and-answer session with GM Jim Hendry from 10-11 a.m. on Saturday, whild Sandberg and former teammate Andre Dawson will talk at the 25th anniversary celebration from 10:30-11:30. The opposing managers will be speaking at different ends of the Hilton hotel. -- On Friday Andre Dawson will make his first Cubs appearance since getting into the Hall of Fame. -- Saturday the Ricketts family will take questions from fans. This is your chance to ask about payroll and Wrigley Field bathrooms. -- Sunday, Koyie Hill, Jeff Baker and John Grabow will talk about the essence of being a Cub, a topic that Milton Bradley touched on last year.